Netflix keeps pumping out the crime/comedy/thrillers, and I don’t see any reason they should stop. The next level is actual Hollywood-caliber hits, like War Machine or the upcoming Okja or Bright, but for now this genre is supporting itself and each film they pump out of the factory is at least decent. The problem is, and maybe this is why their next projects include much bigger stars, these toss-away, 90-minute, caper-gone-wrong flicks don’t have high enough ceilings to be anything more than good. I Don’t Feel at Home, Small Crimes, Handsome; these movies are OK, they’re fine, and they’re doing their job, but they won’t bring the buzz that I’m sure this budding production company would love. Shimmer Lake is no different, a cool cult-feel comedy that’s enjoyable, but not that memorable. There has been a bank robbery, and everyone involved in it has either ended up dead or disappeared. To get to the bottom of this case, we’ll have to travel back in time step by step, recreating the kooky heist one bad decision at a time, until the real culprits are revealed. Zeke is the sheriff of a sleepy town, one that’s known only one big incident in its recent history, and that case may be exactly the clue that will crack open this one. Zeke’s brother, Andy, and the local judge, Dawkins, once let a murderer off on simple drug charges. Now Ed is out of prison, has teamed up with dimwitted Chris, and has devised with Andy a bank robbery, stealing cash from none other than Judge Dawkins. It’s an insane mix of motives and characters, but we’ll get to the bottom of it, or die trying. The film is presented backward, with each day playing out in its entirety, but then, at the end, the next scene begins with the previous day. Make sense? Watching it is fairly easy, it’s not a head-scratcher like Memento or something, the director just wanted to do something unique. Well, he did I guess, but it isn’t really worth it. If the story had been told normally, we would have had a Fargo-style dark comedy, and perhaps then we would have called this film a copy, so maybe it was a lose-lose situation. 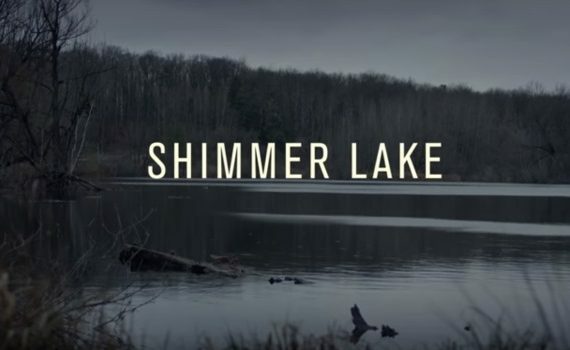 As it stands, Shimmer Lake is fun to watch, but not much more than that. Walker is the straight man, Wilson & Higgins are fine, but it’s the Feds who steal the show, played by Rob Corddry and Ron Livingston, in small parts that make a big impact comedically. Netflix is pumping out solid features, but I’m still waiting for something more.